The Granting Grace Foundation For Childhood Cancer is a 501(c)(3) non-profit organization that is dedicated to supporting pediatric cancer research to limit side effects of treatment and eventually, to find a cure. We also support families that are dealing with the fight of childhood cancer. The inspiration for this movement and forming of the foundation is Grant Gossling, a joyful 2 year old who was diagnosed with stage IV neuroblastoma, a solid tumor cancer, on June 18th, 2014. Grant was in the fight of his life and endured almost 2 years of aggressive treatment including chemotherapy, stem cell transplant, radiation therapy and immunotherapies. His parents, Michael and June Gossling (Grant was #4 of 5 children), were tossed into the unknown world of childhood cancer and quickly realized how little awareness and funding there is for the children fighting this disease. 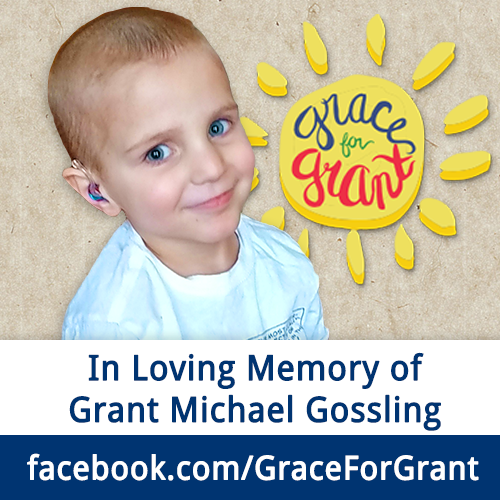 Unfortunately, after a long and brutal battle, Grant Gossling passed away on March 28th, 2016 in his parents arms as a result of the side effects of the treatments that he had to endure. Out of all the money the government gives to cancer research, less than 4% of it goes to fund pediatric cancer research, yet pediatric cancer is the #1 cause of death of children. Every day, the families of 46 children have to endure a parent's worst nightmare and hear, "your child has cancer". Every day, 7 children will die from childhood cancer. Of those that survive, many of them will have to endure life-long side effects, including hearing loss, learning disorders, and infertility. This is directly due to the fact that there is not enough money to fund research and clinical trials specifically for childhood cancer. Pediatric cancers are not the same as adult cancers, and the treatments should not be the same either. More funding will lead to better treatments for children battling cancer, treatments with fewer side effects so they can stay stronger longer and fight harder. We hope you will join us in the fight with these brave children. is a registered 501(c)(3) Non-Profit Corporation.